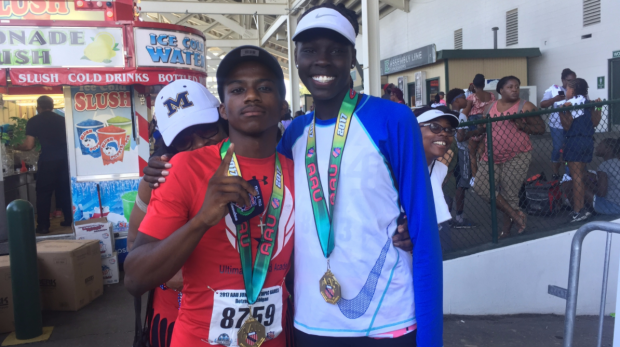 Brandon Miller and Athing Mu are two of the most dominant athletes at the AAU Junior Olympic Games this year, and they both compete in the 800m and 1500m for the 15-16 age division. Luckily, they don't have to race each other. Both Miller and Mu won their respective 1500m finals today in near-record time. Miller, who runs for Ultimate Speed Academy in St. Louis, Missouri, ran 4:02.59, three seconds off Jim Jennings' hand-timed standard of 3:59.2 set back in 1980. Mu of Trenton Track Club in New Jersey clocked 4:33.04 for the win in the girls division, less than a second off the 14-year-old record of 4:32.59 set by Gabrielle Wilkinson in 2014. Tomorrow's 800m finals will likely be a different story. Miller had his eye on Jennings' AAU national championship record for 1500m, but a twinge in his hamstring prevented him from racing full-throttle. Instead of his traditional lead-from-the-gun style, the rising sophomore at John Burroughs High School tucked in between his competitors and didn't take the lead until a decisive move at the bell. "Before the race, my hamstring was a little sore," he said. "So I decided to hold back the first few laps and then the last one I just decided to go for it." He closed in 56 seconds, which was enough to put three seconds on the runner-up, Jeron Jordan, though his final time was just off his personal best of 4:02.09, which he set last August at the AAU Junior Olympic Games and which still stands as the national championship record for 14-year-old boys. Part of the reason that time still stands as his personal best is because Miller has been more interested in pursuing 800m records this year. The pursuit for glory has paid off as he broke Michael Granville's storied national freshman class record with a 1:50.84 effort to win the Missouri State Championships. In tomorrow's 800m final, he hopes to break his third consecutive age group world record. He owns the world records for 13-year-olds (1:56.41) and 14-year-olds (1:51.23), though he has a rival, Max Burgin, for the 15-year-old category, as the Brit set the current age 15 record at 1:49.42 earlier this summer. Track Nation doesn't know quite as much about Mu, though she is nearly as big a talent. That's because the New Jersey native doesn't compete for her high school or during the scholastic track and field season. Even so, she's built up a resume that includes two consecutive AAU Junior Olympic Games titles in the 800m, and two runner-up finishes in the 1500m. Last year's 14-year-old girls 1500m battle between Mu and London Culbreath, who would go on to set the national freshman class record for two miles this year in 10:04, was particularly fierce, as the duo ran 4:35 and 4:36. Without Culbreath in the field this year, Mu ran the 1500m final this morning completely alone -- though somehow managed to come within a second of the national championships record and improve her personal best by three seconds. "It feels great [to win] since I didn't get it last year," Mu said after the race "My strategy was just to get out and be the leader of the pack and throughout the next lap keep a steady pace. When the 800m comes, pick it up and at the 400m, just give it all i've got. I really did have my eyes on the record but it's really... it's not sad, it's just like, 'aw man, I didn't get it.' But I'll be in the same age group next year so I'll probably get it then." Now, her eye turns to tomorrow's 800m final, where she hopes to improve both her personal best of 2:07.18 and the AAU national championships record of 2:07.08, which happens to belong to another New Jersey phenom -- Ajee' Wilson, the 23-year-old American record holder.